Lord, help me be like a tree planted by streams of water, which yields its fruit in season and whose leaf does not wither. 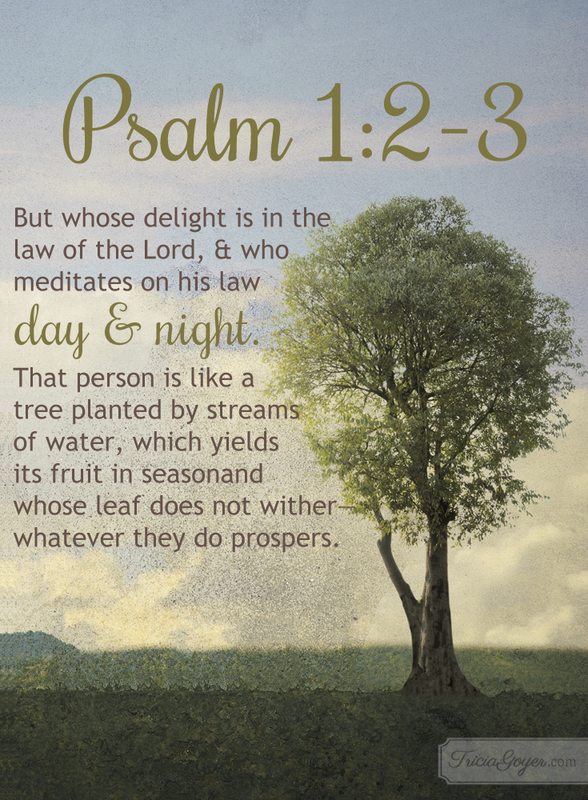 May I delight in the law of the Lord, meditating on it day and night. And because of your word planted deep, may whatever I do prosper and bring glory to your name. found my new memory verse! As always Tricia– you give us what we need in today’s world of upheaval. This is a psalm that I memorized long ago and it really speaks to me! Our God blesses us continually! Thanks and blessings to you and your family. I know how busy you must be. I homeschooled my four. Now my daughter-in- law is homeschooling her two! I didn’t have it all together then but I’m glad I did it! They survived and so did I! My husband was getting two masters degrees and a doctorate at the same time we homeschooled and I also worked full time from the time our youngest was three. He is now 26. Blessings and continue what you are doing. God is using you to bless others! Wow, Paula. It sounds like you had many busy years, but it’s wonderful that you all survived! LOL. I’m so glad you were blessed by this Scripture.